Solar Eclipses have fascinated people since the beginning of time, and is one of the only astrological events that most people stop and pay attention to. Even though the cosmos is always putting on beautiful displays for us, a Solar Eclipse is definitely one that you cannot ignore, especially the upcoming Total Solar Eclipse, which will peak on August 21, 2017. During a Total Solar Eclipse, the Sun, Moon and Earth will be in complete alignment. The three cosmic forces, the holy trinity of our Universe, will come together as one, almost like a grand reset that will help to bring about the start of a new cycle. 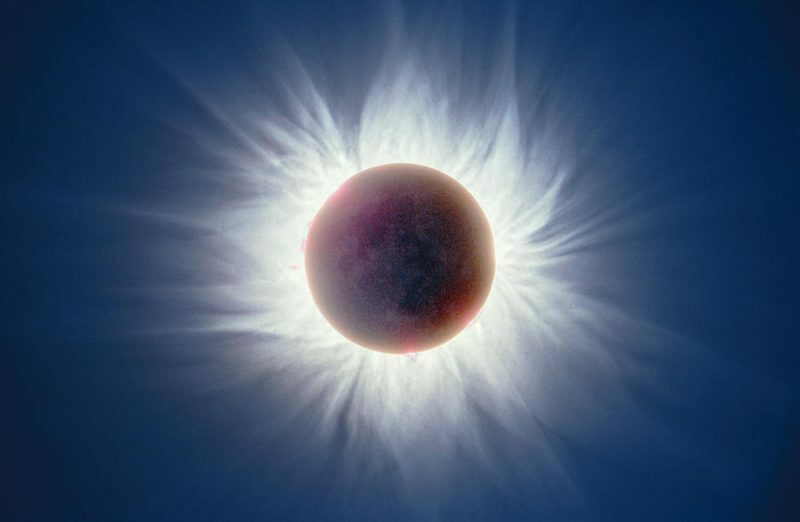 You can read more about the astrology and spiritual themes of the Solar Eclipse here, but this article is going to focus more on what is happening on a mind, body and soul level. The cosmos is affecting us all of the time, but when something as profound and as grand as an Eclipse occurs, it is likely you are going to feel it on many levels. Although NASA states that a Solar Eclipse has nothing but a psychological affect on us, many other cultures around the world, mystics and myself included believe otherwise. Sure, while there is no scientific proof, if you take a moment to really still and connect with your body, you may just feel something shifting. During a Solar Eclipse there is a definite change in the vibration and frequency of energies on Earth. Seeing as we are all connected and part of these vibrational frequencies, it is likely that we are also going to feel this. Your balance may be affected, or you may feel out of sorts, you may also feel extra sensitive to the energies and emotions of those around you. On a deeper level, this change in frequency and vibration can also help you to create your own “reset” and can help you to lift your energetic vibration to a whole new level. Animals can actually sense an Eclipse and often display erratic behaviour leading up to and during the event. One study conducted on spiders found that during a Solar Eclipse the spiders dismantled their webs and built them up again once the Eclipse had passed. With all of these subtle, yet noticeable effects in the world around us, it is very likely that a Solar Eclipse is affecting us on a much deeper level than we even realize. Our circadian rhythms are dependent on the rising and setting of the Sun, and when darkness falls during the middle of the day even just for a few hours, it can definitely have an influence on our body. Besides feeling tired and lethargic, a Solar Eclipse can also help to activate a dream like state and is actually a perfect time to meditate or conduct a ritual. Our circadian rhythms are also controlled by our pineal gland, which is the gland also responsible for the opening and awakening of our third eye. When darkness falls due to a Solar Eclipse, it can help to activate the pineal gland, which can bring about a spiritual awakening of sorts. From an astrological point of view, a Solar Eclipse is all about new beginnings and making a fresh start in your life, so it seems only fitting that an awakening of some kind would be part of this process. According to Native American Shamans, a Solar Eclipse represents a powerful time of healing. The alignment of the Sun, Moon and Earth represents the dissolving of differences and the coming together as One. During a Solar Eclipse, emotional wounds can be healed and stronger relationships can be forged. This can then bring about a mutual understanding and can help the world to unite in love and harmony, rather than being in opposition. In some Indian cultures, a Solar Eclipse has a more foreboding message and it is believed to be a time where evil can rise to the surface. Pregnant women are warned not to go out side and many will not eat food during an Eclipse. It is believed that Solar Eclipses can also cause digestive disturbances and crops harvested and eaten during an Eclipse can be devoid of nutrients. In fact, in many cultures a Solar Eclipse is viewed as a negative omen and is believed to create natural disasters such as earthquakes and so on. When it comes to cosmic events like this a Solar Eclipse, intention is everything so follow your own instincts and see what resonates and comes up for you. For the August 21st Solar Eclipse specifically, I have witnessed many people around me going through lots of changes and new beginnings. On a physical level, I have also felt extremely ‘light’ and even a little bit depleted. A few of my friends have commented feeling the same. If this resonates with you, doing grounding exercises, eating root vegetables and meditation can also provide relief. For those sensitive souls out there, you may feel the energies intensifying as the August Solar Eclipse gets closer, so just be gentle with yourself and practice lots of self love and self care. PS. If you plan on looking at the Eclipse be sure to use special eyewear so you don’t damage your eyes!